People lose their teeth for a variety of reasons: injury, trauma, dental caries (tooth decay), and gum (periodontal) disease. BGH Dental offers replacement teeth that look beautiful and function just like healthy, natural teeth. In the past, people had to wear traditional dentures, partials, or bridges to replace teeth. Today, we offer more contemporary versions of these prosthetics, as well as dental implants. Left untreated, tooth decay won't heal. On the contrary, the bacterial infection will spread and could ultimately affect the life of the afflicted tooth and your oral health. The treatment for a mild cavity is a dental filling, which takes just one visit to place. In the past, amalgam fillings were the gold standard for cavity treatment. Today, however, we have an esthetic option that looks totally natural: tooth-colored composite resin fillings. If we find that you have tooth decay, our doctors will recommend the best filling for the location and extent of your cavity. 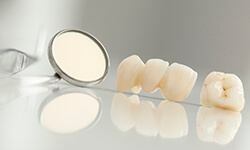 However, we typically recommend composite resin fillings that offer a stronger restoration option. The material is applied directly to the damaged tooth in a putty-like consistency and seeps into the smallest pits and grooves in smiles. Once in place, we use a curing light to harden the filling into position. We can also use composite resin for purely cosmetic treatments. CEREC stands for Chairside Economical Restoration of Esthetic Ceramics, or CEramic REConstruction, and is a high-tech system that designs and manufactures crowns and other restorations such as veneers, inlays and onlays in a single appointment right here in our office. 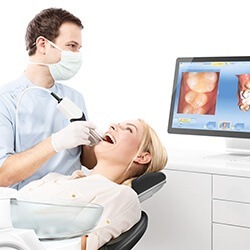 The system includes an infrared digital camera to capture a visual image of your tooth, 3D CAD software to design your crown and a milling unit that constructs your customized same day crown. Everything is getting faster these days. Whether it’s your phone, your computer, or even your car, speed is the name of the game. Fortunately, high-quality dental care has been able to keep pace with an ever quickening world. Thanks to CEREC in Greenfield, MA, a person with chipped, cracked, broken, or misshapen teeth can now get a customized all-porcelain crown in as little as one hour. Following severe tooth decay, dental cracks or fractures, and other trauma, we may be able to repair the compromised tooth structure with a dental crown. The more conservative restoration option, fillings, are only strong enough to repair minor decay or damage, but dental crowns fit over the top of damaged teeth. This completely restores the form and function of damaged teeth and providing protection for the remaining healthy dental structures. Two dental crowns can be used to support one or more replacement teeth called pontics. By attaching a dental crown to either side of the replacement tooth or teeth, the tooth replacement prosthetic can be anchored to healthy teeth surrounding the lost tooth. We offer crowns and bridges made from a variety of materials including all porcelain, zirconia, gold, and porcelain fused to metal. 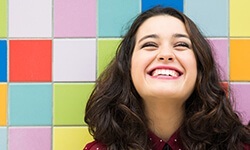 Before we begin the treatment process, one of our skilled dentists will explain the advantages of each of these materials and help you choose the best option for your unique oral health needs. Once we determine which material is best suited to your restoration needs, the process is completed over the course of two appointments. During the initial visit, we’ll prepare your tooth or teeth to accommodate the dental crown or fixed bridge. Then, we’ll capture bite impressions and place a temporary restoration. When we receive the final restoration from the lab, you’ll return to exchange your temporary for a custom restoration. Missing teeth negatively impact one’s overall health and well-being in many ways. A person with missing teeth is at higher risk for bone loss, poor nutrition and sunken facial features. People with missing teeth often experience lower levels of confidence. Dentures can change the way you eat, feel, and look. There is no reason you have to live without a natural looking smile. The fit, feel, and function of modern dentures are far superior to past generations. 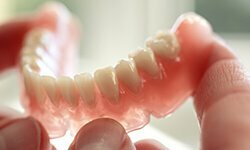 If you need a full set of teeth that will serve you well physically and emotionally, talk with us about dentures. When several teeth are missing, we may recommend a partial denture. Partials are made up of several artificial teeth attached to a plastic piece that looks like natural gum tissue. Clasps on the appliance fit onto healthy, natural teeth to offer support. If you need multiple bridges, a partial may provide a less invasive alternative. Root canals have a reputation for being extremely painful. However, the procedure itself actually relieves pain. By removing the damaged or decayed dental structure that has accessed the tooth’s nerve system, root canal therapy allows us to preserve the remaining healthy tooth structure while restoring the full form and function of damaged teeth.